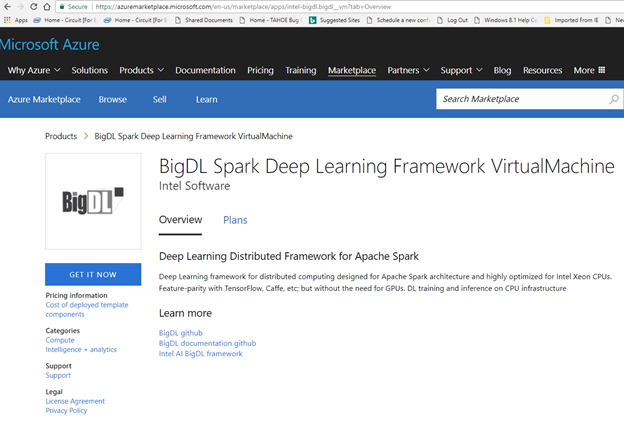 BigDL deep learning library is a Spark-based framework for creating and deploying deep learning models at scale. 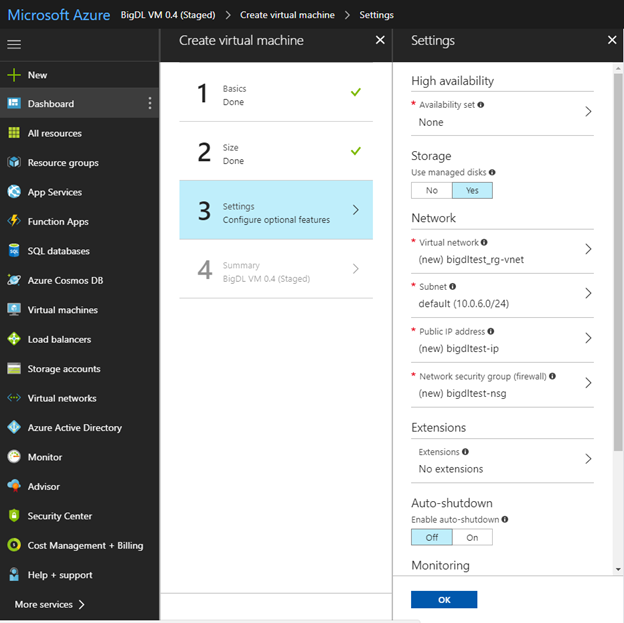 While it has previously been deployed on Azure HDInsight and Data Science VM, making it available on Azure Marketplace as a fixed VM image represents a further step in reducing the deployment complexity. 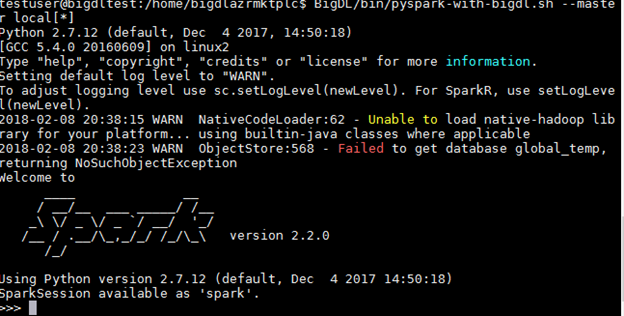 Since BigDL is an integral part of Spark, a user does not need to explicitly manage distributed computations. While providing a high-level control “knobs” such as number of compute nodes, cores, and batch size, a BigDL application leverages stable Spark infrastructure for node communications and resource management during its execution. BigDL applications can be written in either Python or Scala and achieve high performance through both algorithm optimization and taking advantage of intimate integration with Intel’s Math Kernel Library (MKL). 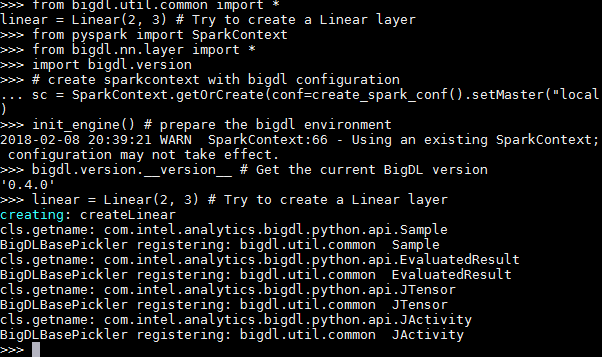 For more information about BigDL features and capabilities, refer to the GitHub BigDL overview and Intel BigDL framework. 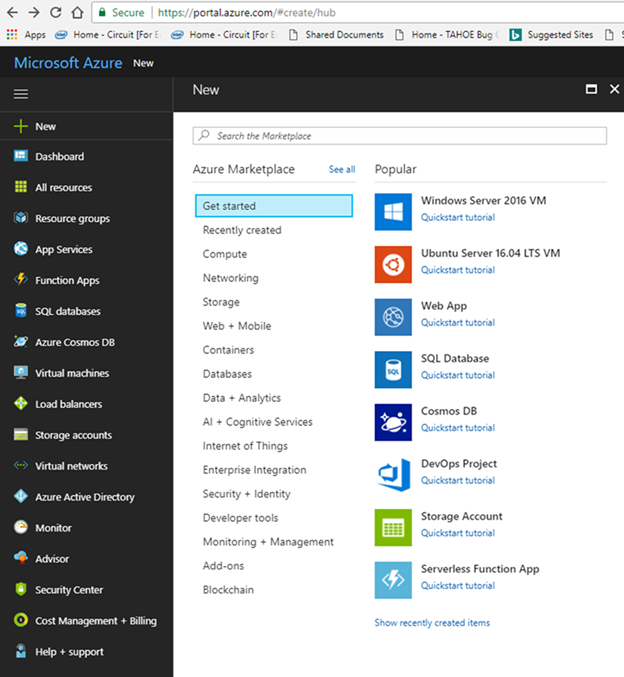 What is the Microsoft Azure Marketplace? The Azure Marketplace is an online applications and services marketplace that enables start-ups, independent software vendors (ISVs), and MSP/SIs to offer their Azure-based solutions or services to customers around the world. Learn more information on the Azure Marketplace. 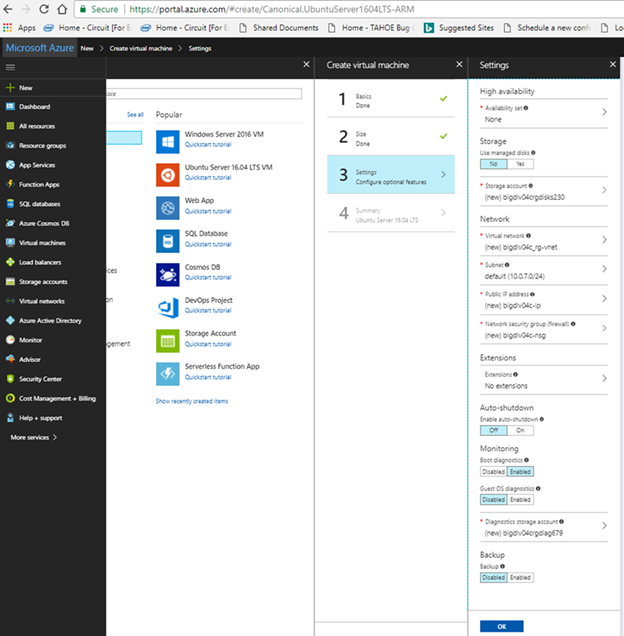 First scenario: Deploying an Azure VM with a pre-built BigDL image and running a basic deep learning example. 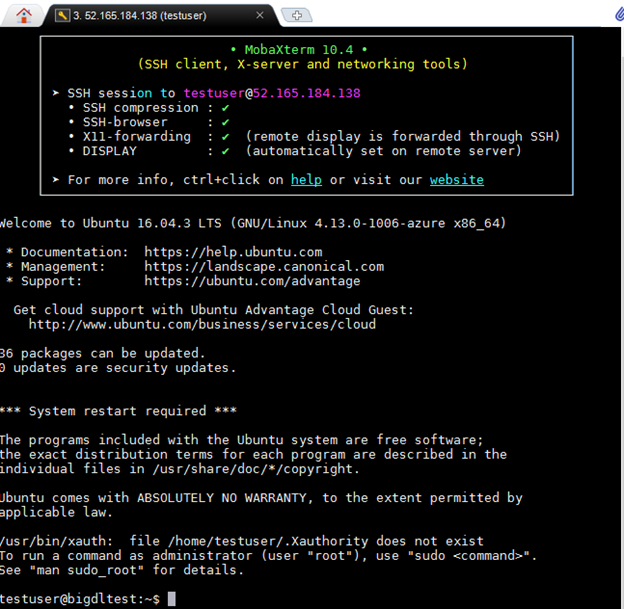 Second scenario: Deploying BigDL on a bare-bones Ubuntu VM (for advanced users). 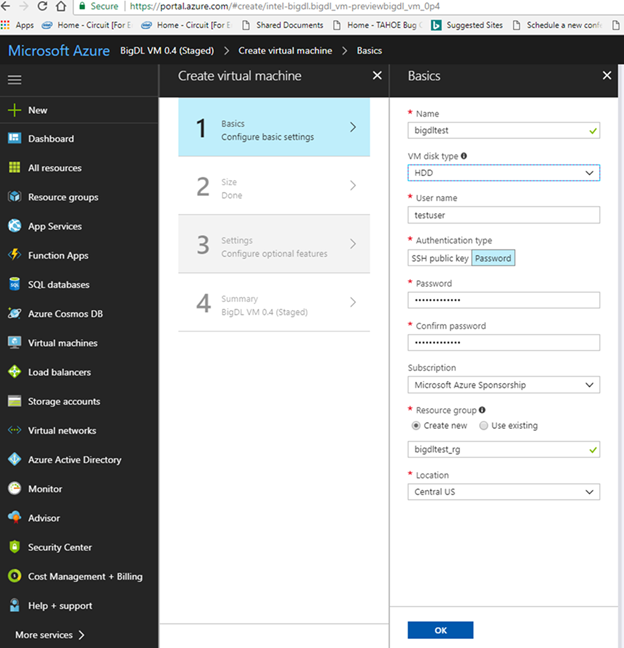 Log in to your Microsoft Azure account. 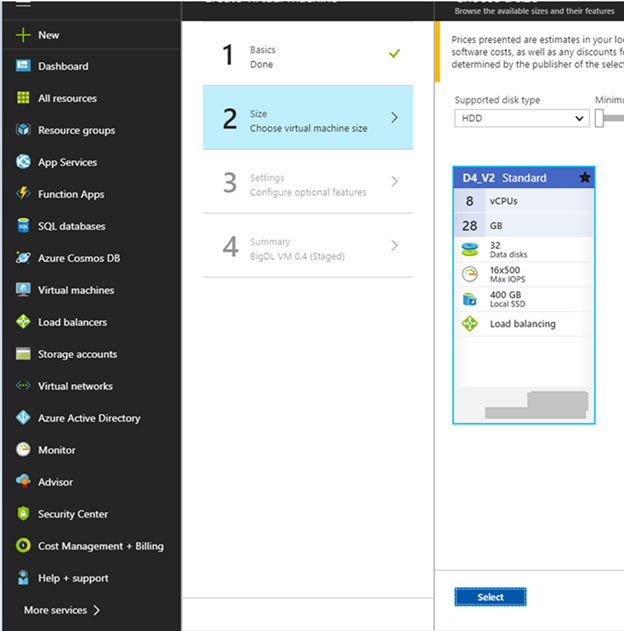 BigDL requires you to have an Azure subscription (you can get a free trial). Navigate to BigDL offering on Azure Marketplace and click Get it now. You should see the following page. Click on the blue Create button at the bottom. Enter the requested information in the fields at the prompts. 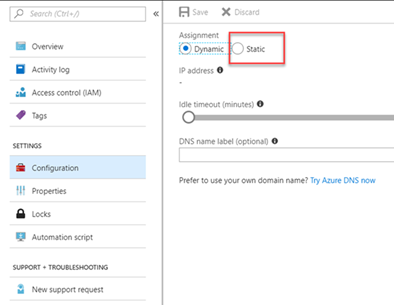 Note that Azure imposes syntax limitations on some of the fields (such as using only alphanumeric characters and no CAPS). Use lowercase letters and digits and you will be fine. Use the following three screenshots for guidance. After the VM is provisioned, copy its public IP address. Note that this public IP address will change every time you stop and restart your VM. Keep this in mind if you are thinking of BigDL automation. You are now ready to SSH into your BigDL VM. You can use your favorite SSH client. For this example, MobaXterm is used. Enter the IP address and the username you selected when creating the VM. Before using pre-installed BigDL, you will need to change ownership of the directory. BigDL was pre-installed into the bigdlazrmktplc directory. Yet ‘testuser’ does not have full privileges to access it. Now ‘testuser’ owns the bigdlazrmktplc directory. BigDL is now ready for you to use. First, you will need to create an Azure subscription. You can get a free trial by navigating to BigDL offering on Azure Marketplace and clicking Get it now. Log in to the Azure Portal, go to New, and select Ubuntu server 16.04 LTS VM (LTS = Long Term Support). Enter the basic VM attributes using only lower-case letters and numbers. 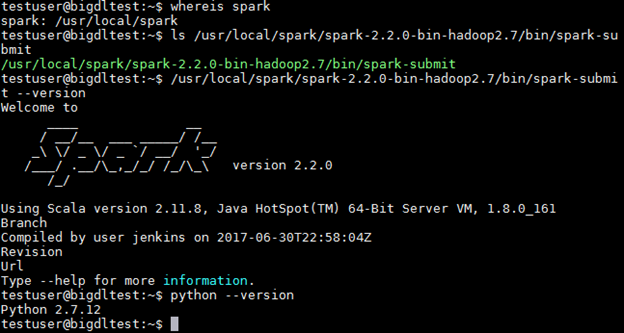 For Spark jobs you want to select VMs with a large amount of RAM available. 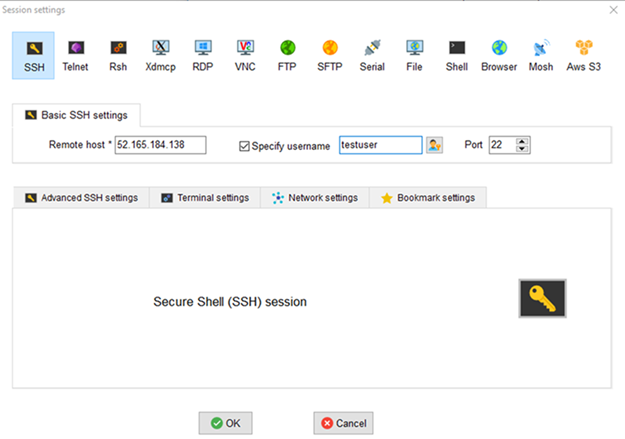 Once your VM has been created, you can SSH into it using the username and password which you created previously. The main repo for BigDL downloadable releases. 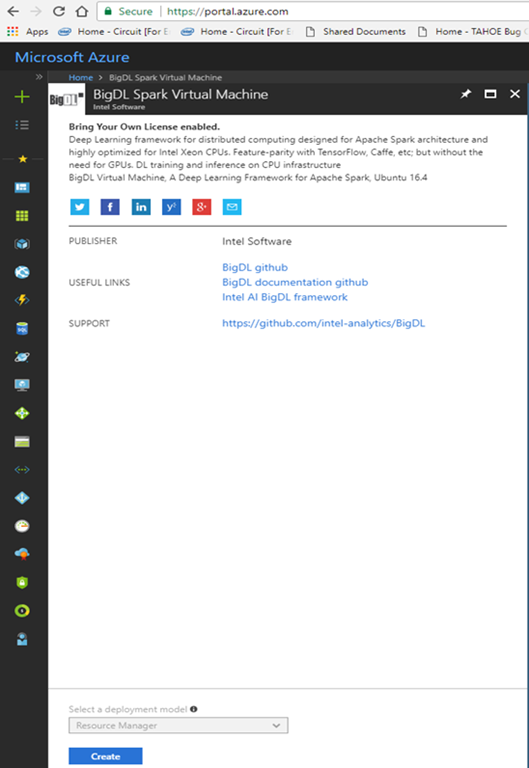 Ubuntu 16x on Azure comes with pre-installed python 2.7. However, there are a couple of additional packages that must be installed. Follow these instructions to verify that BigDL was installed correctly. At the prompt, copy and paste the following code, this code can also be found at Github. Your VM is now ready for running deep learning examples at scale.